The sun is out and suddenly all I want is some Ben & Jerry’s ice cream. It truly is don’t-touch-my-pint-or-I’ll-kill-you good and when the sun comes out and the summer weather kicks in, it becomes nearly irresistible. Practically by default Vermonters are Ben & Jerry’s experts. We all know that Ben & Jerry’s is headquartered right here in Waterbury. We’ve frequented their factory tour and we’ve seen how active they are in our community. But did you know they are one of the Spotlight Sponsors for the Stowe Street Arts Festival and will be serving their locally made yumminess on Saturday, July 16 in downtown Waterbury? You did, huh? Well how good is the rest of your Ben & Jerry’s knowledge? Take our little Quiz and the first person to comment ON THIS BLOG POST with all the correct answers will win a free pint! You can find out all the answers and more if you can find Ben & Jerry’s online, on Facebook and on twitter. But the answers will be posted here tomorrow at noon so study up right away! How’s your Ben & Jerry’s IQ? Ben & Jerry’s sells lip balms in flavors like Mint Chocolate Cookie and Cookie Dough. In 1987, Ben & Jerry’s introduces its Cherry Garcia® ice cream flavor. Named for Ben & Jerry’s founder, Jerry Garcia. Ben & Jerry’s ran a two-pronged national search for a new CEO, by hiring a search firm and by holding a “YO! I’m Your CEO!” contest inviting 100 word applications from anyone interested in the job (First Prize) or in a lifetime supply of ice cream (Second Prize). There are more Ben & Jerry’s Scoop Shops in Texas, Hawaii and Alaska than there are in Vermont. 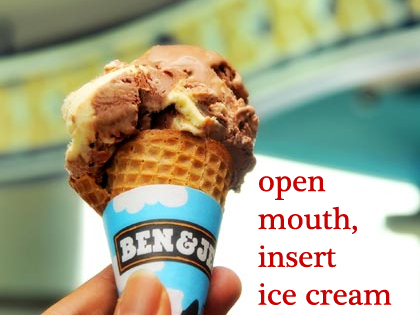 You can find Ben & Jerry’s in Singapore, Aruba and Israel. As part of an April Fools’ Day national launch of Ben & Jerry’s newest flavor, “Dilbert’s World™ Totally Nuts™,” the company teamed up with United Airlines to surprise two planeloads of passengers by deplaning them to arrival gates “cubicle-ized” to resemble comic strip character Dilbert’s totally nutty workplace world. All passengers were awarded reimbursement checks to cover their airfare, as well as samples of the new flavor. Ben & Jerry’s teamed up with Stephen Colbert for the flavor AmeriCone Dream. Colbert was determined to out-sell Willie Nelson’s new flavor, Peach Cobbler. Ben & Jerry’s doesn’t sell a Vanilla Ice Cream. This entry was tagged community, free pint, ice cream, IQ Quiz, sponsor, spotlight sponsor, sunshine, warm weather. Bookmark the permalink.